Oddly, Obama is willing to kill anyone except Gadafi in attempting to topple his regime. Muammar Gadafi (also spelled Gaddafi, Ghadafi, Gadhafi, Kadafi, Khadaffi, Qadhafi, al Gathafi, al Qaddafi, Algathafi, Al-Gaddafi, Kadafi, Gadafy and Al-Gathafi. Gadafi himself transliterates the Arabic many different ways.) pictured in the top left corner, before he lost his looks) is clearly a bad guy. He is dictator of Libya, egomaniac, eccentric fashion designer and fruitcake. The world suddenly decided to invade Libya to oust him. Though I like the idea getting rid of dictators and apartheid regimes such as Israel, helping establish democracies, I have grave doubts about this particular action. The US military announced the best they could hope for was a political coup where Gadafi was replaced by another dictator, more friendly to US interests (e.g. who would let the Americans strip Libya of her oil). The Libyans hardly be better off. They need a democracy not a dictatorship even more corrupt than Gadafi. As dictators go, Gadafi, up to now, has behaved quite well. His people enjoy the highest standard of living on the continent. Unlike your garden-variety dictator, he has not sold out his country for personal wealth. By the law of averages, a successor dictator will behave worse in that department. I think there at least a half dozen dictators who pose a greater danger to world peace. Why him? Why not the even worse dictators? The war is being fought without ground troops. This helps reduce American/French/British… casualties, but it increases Libyan civilian casualties. If you drop bombs from high altitude you have little idea whom you are killing. You have seen the pictures of bombed out buses and automobiles, the result of blind bombing. The U.N. has tried no-fly zones three times before. Each lead to a protracted war. Obama is using the no-fly zone gambit to soft-sell a third war. Obama bills himself as a peace candidate, but he has amplified the Afghan war, continued torture in Guantánamo, Afghanistan and Iraq, dragged on the Iraq war and now started a new war. Other than refraining from incendiary rhetoric, Obama is no better than George W. Bush. Obama is just as much in the pocket of the defence war industry as W. was. They may have threatened him. They are utterly ruthless sadistic people who enjoy making children maximally suffer. They may have bribed him. He may have been in their pocket all along. He betrayed American to Wall Street. We could see that coming because he accepted so much money from Wall Street during his election campaign. A few cruise missiles might discourage Gadafi but it won’t get rid of him. This is a bit like hitting a wasp nest with a stick. He will have no compunction about roasting babies alive or similar atrocities. If the west corners him without an out, he will resort to anything, even nukes. War hurts the entire population. You are punishing the wrong people. You want to focus on taking out Gadafi, not the people who are terrified of him. Unlike Iraq and Afghanistan, Libya is a relatively wealthy country. It has a modern military. It could be a much harder nut to crack that either Afghanistan or Iraq. The USA even with 100,000 ground troups is no closer to conquering Afghanistan after a decade. The USA cannot afford an even bigger, more costly war to conquer Libya. Obama has flagrantly violated the constitution by waging war without getting permission of congress first. He has no excuse. The security of the USA was not at issue. He is a constitutional lawyer. He knows what he did was illegal. Why the sudden interest in getting rid of Gadafi after decades of leaving him and other dictators in peace to torment their populations? He has oil. The intensity of competition for oil is heating up as supplies dwindle. He has been weakened by internal revolt. He is playing hardball suppressing the revolt. The Afghan and Iraq wars are becoming unpopular. Something has to be found to replace them that will justify shovelling trillions of dollars to the military contractors and defence contractors who bribe the politicians. Watch the politicians at the Paris summit grandstanding and hamming up their condemnation of Gadafi. They are primarily using this war to boost their political popularity. Starting a war is an age-old trick to boost poll ratings. This is not a soberly thought out invasion. It is the result of alpha-male group gonad thinking, a sort of get them! mindless war cry. Gadafi has been accused of terrorism and having nukes. If he feels he is cornered, he could use these weapons. The Libyans and the Arab world also want Gadafi out. 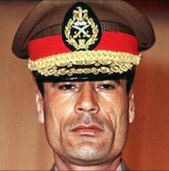 It is not as though the USA has to defeat Gadafi alone, just tip the balance. Gadafi is nuts. It is not just a matter of a being greedy, selfish or incompetent. Many other countries are eager to take a shot at Gadafi. The USA can back out saving face more easily than they can their other wars. Stop randomly killing Libyans with cruise missiles. Blockade exports. Without that money, Libya will come to a standstill and Gadafi will not be able to fund his military. Blockade imports of luxury goods. Use Mossad-like tactics to execute Gadafi. On 2010-03-20, the Pentagon announced it was not targetting Gadaffi. Strangely will willing to kill everyone except the source of the problem. As soon as Gadafi is gone, announce the date of a U.N. monitored election.